Both peonies and daylilies are favorite perennials that require very little maintenance once established and yield proficient blooms for many years. They can be divided to increase their yield or to share with friends; it’s a simple procedure that doesn’t take a lot of time. The trick is to do it at the right time. Healthy daylilies are very lush and have numerous flowers on each stem. When the foliage thins out and the plants produce fewer flowers, you need to divide them. Daylilies should be divided in late summer, preferably by early September so their roots can get in some growing time before winter. Use a garden fork to carefully remove the plant, making sure you grab the entire root ball. You can divide this section in half by inserting two garden forks in the middle and carefully pulling them apart to separate. Dig a hole slightly less deep than the height of the rootball and plant it. Place the dirt around it, mulch and water. Peonies can be divided anytime from early September until December. The main thing is to wait until the ground is neither too wet nor too dry; either extreme makes it hard to divide them. Measure about 6 inches out and use a spade to dig about 2 feet down all around the plant. You’ll hear the roots snapping as you lift the plant out, and that’s okay. 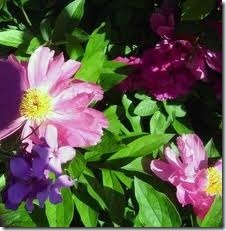 With the peonies, you need to wash the roots off with a hose before dividing. Look on the upper part of the roots for the eyes, which are small, pink bullet-shaped nodes, to know where to divide. According to the American Peony Society, "The standard root division is a piece of crown possessing three to five eyes with two or three maturing attendant roots."